Settled in the rugged hills of the Aravallis, Jaipur is the pristine jewel in the desert sands of Rajasthan. Jaipur is as remarkable for its marvellous architecture and town planning as it is for the lively spirit of the people who inhabit it. A city like Jaipur, where modernity and tradition live hand-in-hand, is truly rare. Perhaps this is what makes it an attractive destination for tourists who flock to Jaipur , year after year. Jaipur is located in the Northern India at a distance of around 258 km from Delhi. The city would have been the part of Thar Desert, but for the Aravalli Hills that provides it with much needed security from one side. Climate of Jaipur is extreme with hot and humid summers and chilly winters. Maximum temperature during the summers (from April to July) reaches a high of around 45ºC. On the other hand winters have sunny and pleasant days and bitterly cold nights. Temperature can touch a low of around 5ºC, mostly during the nights. The historic city of Jaipur or "The City of Victory" was founded in 1727 A.D. by the great Kachhawah ruler Sawai Jai Singh II (1700 - 1747 A.D.), and named after him. The city is rectangular in shape and divided into nine blocks on the basis of principles laid down in the "Shilpa Shastra", the ancient Indian treatise on architecture. Hawa Mahal is located in the Tripolia Bazaar to the west of GPO. Built to let the ladies of royal harem watch the royal possessions, Hawa Mahal is not a palace as the name suggests. 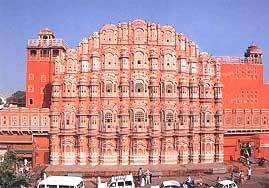 Hawa Mahal is the part of the east wall of the City Palace complex. Most well known of Jaipur's buildings, you can have the best views of this great building from the street outside. A major part of the City Palace has been converted in a museum. Remaining part of the palace is still being used by the royal family of Jaipur as residence. The palace is built in the fortified campus style and covers almost seventh part of Jaipur. There are different sections of the museum dedicated to subjects like arms and ammunition, textile and costume, and art gallery. Translated into 'Instruments of Measuring the Harmony of the Heavens', Jantar Mantar was built by Sawai Jai Singh between 1728 and 1734. Jantar Mantar is a grand celebration of astronomical science and each instrument here serves a particular function and gives an accurate reading. Most of the fort is now in the ruins but it is a pleasant attraction in terms of stunning views you get from here of the countryside. There are few visitors here and solitude inside the ramparts of the fort makes the fort worthy of a good visit. The fort is lit beautifully in the night and dominates the skyline by the day. Earlier known as Albert Hall. The building is located in sprawling Ram Niwas Garden and houses precious collections of metalware, miniature portraits, and other pieces of art. Amber is located around 11 km north of Jaipur. This site is one of the most popular in India during the tourist season and elephant rides from the base of the fort to the hilltop. There are excellent views from the hilltop of the countryside and Maota Lake below. You can also boat on the lake for fixed amount of money. Jaigarh Fort or the Victory Fort is another fort palace of Jaipur located not far from the Nahargarh Fort. Main attraction inside the fort complex is the series of water reservoirs built to store and supply clean water to Jaipur City. Jaivan was the largest hand operated canon in the world and weighs 50 tones. The fort is almost intact as the enemies could never capture it and most of the parts are open for public viewing. Situated just 8 km away from Jaipur, Gaitor has the marble and sandstone chhattris of the rulers of Jaipur. These chhattris were built by Jai Singh II and set in landscaped gardens. Sisodia Rani ka Bagh is located 8 km east of Jaipur on the Jaipur - Agra road. This garden palace was built for the second wife of Jai Singh and has attractive tiered gardens with mountains, watercourses, and pavilions with murals. Sanganer is located 11 km southeast of Jaipur and serves as the airport for the city. The small town of Sanganer located near the airport is famed for its block-printings and papermaking craft traditions. Young girls and newly married women praying for their loved one or husband respectively, offer prayers to Goddess Parvati in spring (March-April). A colourful procession follows the silver and gold palanquins of Goddess Parvati brought out from the City Palace. Ghever, the traditional sweet associated with this festival is prepared all over the city. This festival is held on the day of Holi, the festival of colours, at the Chaughan stadium. Beautifully decorated and caparisoned elephants assemble to participate in the royal procession. Elephant polo, elephant race, elephant tug-of-war with a few tourist and holi on elephant back are some of the exciting events. To celebrate the advent of the monsoon, girls and young women dressed in colourful leharia sarees or costumes, sing songs, offer puja to goddess Parvati, and pray for conjugal bliss and happiness. Dussehra is celebrated by staging Ramlila in different parts of the city and culminating in the ceremonial burning of the giant effigies of Ravan, Kumbhakaran and Meghnath, celebrating Lord Rama's victory over the Demon King and victory of Good over Evil. A mela is organised at Amer and thousands of devotees visit the temple of Shila Mataji situated there. Celebrated every year in October- November, Diwali is perhaps the most popular of all Indian festivals. The night is illuminated with the flaming lights of fireworks, creating kaleidoscopic design against the black canvas of the sky. During the Diwali celebration, decoration and lighting is done throughout the walled Pink City. Most people prefer walking through the street to enjoy this dazzling extravanganza. This is where you can buy jewellery and tie and dye sarees. Two lanes joining the mainroad Gopalji ka Rasta and Haldion ka Rasta house numerous establishment selling jewellery. On the main road itself you find many silversmiths. Here you can purchase textiles, local perfumes and shoes made of camel skin. The broad thoroughfare houses a large number of emporia selling a variety of goods ranging from jewellery and brass work to textiles, to blue pottery, to woodwork, etc. You can shop here for textiles, utensils, ironware and trinkets. Ramganj Bazar for shoes or jutis as they are called. Kishanpol Bazar for tie and dye textiles, Maniharon Ka Rasta (Tripolia Bazar ) for lac bangles and other items, Achrol House, Subhash Chowk for carpets, Khajanewalon Ka Rasta for marble carving, and Saganer village for block printing, hand-made paper and blue pottery. Sanganer Airport at a distance of around 11 km from the city center is the main air gateway to Jaipur. There are direct flights to Delhi, Mumbai, Udaipur, Jodhpur, Aurangabad, and some other cities from Jaipur. From Delhi, there are many trains that connect Jaipur and other cities in Rajasthan; foremost among them is the Palace on Wheels. Other important trains include, Shatabdi Express and Pink City Express both from Delhi. From Delhi, there is a direct and well-maintained road to Jaipur. City is connected to most of the tourist destinations in Rajasthan as well as Agra. Jaipur is part of the Golden Travel Circuit of India that includes Delhi, Agra, and Jaipur.